The challenges Twitter has had to overcome in order to scale some of their key services and network. A look at what security related headers there are (X-Frame-Options, Public-Key-Pins, etc.) and how and why to use them (or not). GitHub reflects on some of the mitigations that came out of their efforts to improve their content security policies and avoid content injection attacks. Don't be afraid to use Docker in production. Here's why. 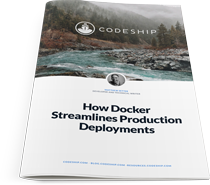 Get our free eBook to learn how Docker helps to predictably streamline the deployments to applications across all environments, from development to production. Things are about to get a lot safer on the internet with SHA-2, but there is plenty of work still to be done when it comes to SHA-1 deprecation. A 44 minute talk looking at the many issues with existing TLS/SSL APIs, as well as how libtls has been designed to be different. Linkerd is a service mesh that transparently adds service discovery, load balancing, & failure handling to apps. Several companies have developed solutions around Facebook’s open networking technologies. Discord is a popular chat system for gamers. They started out with MongoDB but here they explain why and how they moved to Cassandra, and how they dealt with a sticky garbage collection issue. Netcraft’s latest server survey is out. Microsoft takes the largest share of sites, but NGINX saw the strongest growth in the number of servers using it. Knowledge of the critical rendering path for Web pages is useful for understanding how a site’s performance can be improved. Builds upon Docker 1.12’s swarm mode, plus lots of other fixes. New to 3.1 is a smart gRPC proxy for offloading client requests away from the core cluster. The techniques Mozilla uses to implement baseline scans in their infrastructure. The goal is to simplify their network operations. A whitepaper exploring if PostgreSQL on ARM is a viable option for your next project. A handy cheat sheet with explainers of all the available services in Microsoft’s growing Azure ecosystem.